MLB Productions has been in Phillies camp the past week shooting footage for the debut episode of "The Pen," an inside look at the Phillies' bullpen, which is scheduled to debut June 1 on MLB Network. It will be MLB Network's first original programming. "I think it'll be pretty neat," righty reliever Clay Condrey said. 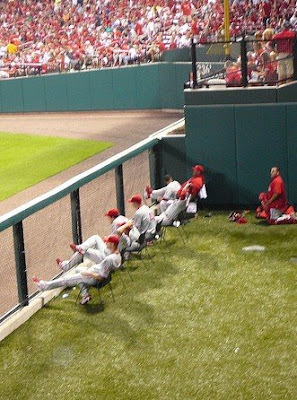 MLB Productions chose the Phils' bullpen for a couple of reasons: First, it had tremendous success in 2008. And second, it has diverse personalities. Six weekly episodes are scheduled to run through the All-Star break. The series is expected to show how a bullpen works, as well as how individual pitchers work together and rely upon each other throughout the course of the season. The show also will visit with the pitchers off the field to give viewers a sense of their personalities and interests. Camera crews are expected to be with the team a few times a month, so they won't be followed everywhere (this isn't "Big Brother" or "The Real World"). Not a bad idea, and as long as they keep it simple, it could be an interesting watch. I think the rule of thumb with reality TV these days, is to just the opposite of what the crazy MTV and VH1 shows are doing. Well at least when it comes to Sports. The show debuts on June 1st, and I'll be sure to grab some clips for those of you in Philly who don't have the MLB Network. I will only watch the Philly bullpen if Mitch Williams is sitting in it. This sounds like a good idea. I've always wondered how those guys passed the time and what kind of stupid debates that relief pitchers get into.